Why should I choose Aviationexam? DETAILED EXPLANATIONS provided for all EASA and FAA questions, many supplemented with pictures. FREQUENT UPDATES ensure a precise representation of the current EASA ECQB and FAA question banks. COMPETENCY LEVELS and license types are covered by our question bank – apply filters to show only the questions relevant to your exam type (e.g. ATPL, CPL, IR ... Airplane, Helicopter, etc). Passing your EASA ECQB exams will be easier with the help of our Test Prep products. Our database offers the possibility to select a reduced DB version for a quick last-minute brush-up or the standard and exhaustive versions for a more extensive coverage of the official EASA syllabus topics. MULTI-PLATFORM CAPABILITY allows our customers to use ONLINE system together with our applications (iOS, OS X, Android and Windows), which do not need a constant Internet connection (full OFFLINE use capability). Use the built-in cloud feature to keep your studies in sync across all your devices and computers. • Picture supplements in high quality. • Make private notes for specific questions. • Built-in navigation computers (CR-3 and E6B). • Discuss specific questions with other students. • Unbeatable statistics, reports and progress monitoring. • Search for specific keywords in questions and answers. • Mark questions for later review or set various question flags. • Sequential functions to make sure you cover every single question. • Library featuring free high quality study books, manuals and handbooks. CUSTOMER SUPPORT is provided in a timely and effective way. SYSTEM RELIABILITY is always among our top priorities. Excellent system uptime statistics are achieved through the use of robust hardware architecture; multiple backup systems and a high-bandwidth server connectivity. Our test prep system will not leave you stranded right before your exams! SOLID COMPANY WITH HISTORY of 10+ years in the business of pilot exam test prep. Aviationexam employs the staff of experts on the EASA ECQB (European Central Question Bank) and the FAA question bank. Additional expertise in various subjects (technical and operational) is provided by active airline pilots. Which version of the EASA ECQB does Aviationexam cover? The question database used by Aviationexam is constantly updated by the team of our EASA ECQB experts. Our goal is to provide our customers with exam preparation tool that uses a set of questions reflecting the current version of the ECQB as closely and accurately as possible. We work very hard to ensure you do not see any surprise questions on your official EASA exams and achieve excellent passing scores. Aviationexam has been in the business of EASA (formerly JAA) exam test prep for over 10 years. Since 2003 we helped thousands of pilots to succeed in their studies and pass their knowledge exams. It is an evidence our experts know what they are doing and that our EASA test prep simply works. Note: see the FAQ topic "size of EASA ECQB" for additional helpful information. What is the size of your EASA ECQB exam prep database? The size of the official ECQB (European Central Question Bank) as maintained by EASA is in the range of 10.000 - 12.000 questions. However, due to the reasons briefly described below, there are several versions of the question bank in use by individual Civil Aviation Authorities (CAAs). At Aviationexam we try to provide students from all countries using the EASA ECQB system with a test prep solution that represents the ECQB as closely and precisely as possible – both in the wording of individual questions as well as in the overall database coverage of the entire EASA exam syllabus. Therefore, due to the continued practice of some national CAAs still using their own modified versions of the EASA ECQB, the overall size of Aviationexam database (number of questions) is slightly larger than the size of the main ECQB version managed by EASA. It is through this slightly increased number of questions in our database we are able to provide a very good overall coverage of the various versions of the question bank currently used by the CAAs in individual countries. The current EASA ECQB has its origins in the question bank used under the former JAA system – the “JAA CQB”. The original idea behind the JAA CQB was that all of the JAA member states would use a 100% identical question bank for the examinations of professional pilots. JAA was supposed to manage the CQB – process the feedback from all member Civil Aviation Authorities (CAAs) with corrections of errors and implementations of new questions to keep-up with the latest legislation changes. However, the reality was a different one. The JAA division responsible for the CQB management was under-staffed and under-financed. As a result the system of correcting errors in the CQB at the JAA level was not working properly. Some CAAs started correcting the errors, inserting new questions and removing outdated ones from the CQB by themselves, but these changes were only applied on the national level => they were only very rarely reported to the JAA or processed by the JAA for implementation into the new CQB versions. This resulted in a situation where little by little the question banks used for pilot exams in different countries started to differ slightly. Some CAAs were using the original JAA CQB while some CAAs were using their own, modified versions of the CQB. When JAA ceased to exist in 2009 EASA took over the latest version of the JAA CQB (ver 15). Just like JAA the EASA also did not have sufficient number of experts available that it could assign to the management of the question bank – the agency had more important issues to deal with at that time. Result? EASA took the JAA CQB, made only a few “cosmetic” modifications of the most evident discrepancies, renamed it “EASA ECQB - version 1” and rolled it out as the “new” EASA ECQB. Since 2009 EASA has made a few improvements of the ECQB, but as of 2015 many errors still persist even though the current version is ECQB 03. To the best of our knowledge the goal of all EU countries using a 100% identical question bank for professional pilot exams has not yet been achieved and there are still several versions of the question bank in use by the Aviation Authorities around Europe as of 2015. We believe that another factor possibly motivating the CAAs in some countries to still use “their own” modified version of an older ECQB (or even of a JAA CQB) is that they have invested a lot of effort and funds into translating the entire database into the national language. Not every CAA has the expert resources available to perform extensive question bank translations on annual basis. Does Aviationexam contain all EASA ECQB questions that I will see on my official exam? The primary objective of our EASA products is to provide students with a test prep solution that represents the actual EASA ECQB as closely and precisely as possible – both in the wording of individual questions as well as in the overall database coverage of the entire EASA exam syllabus. We work hard to ensure our customers get a chance to familiarize themselves with the content of EASA exam question bank and avoid any surprise questions on their official exams. Our database is a remarkably close and precise representation of the questions you will encounter on your official EASA examinations. However, because the ECQB is not officially available to the public and occasionally EASA adding a couple of new questions here and there, there is a chance you might encounter a small number of questions on your final exam that are not yet represented in our database. Typically there is a slight delay between the time new questions are implemented by the authorities into ECQB and the time these questions are represented in Aviationexam database. The number of these new questions varies subject to subject, but on the average is less than 5% of the total question numbers. In summary, we can say that Aviationexam provides customers with a test prep system that has an average representation (coverage) of the EASA ECQB of over 95%. Does Aviationexam contain all FAA questions that I will see on my official written test? Just like with the EASA question bank the FAA does not publish the complete set of official written test questions any longer. Over the last few years FAA has gradually reduced the number of questions it publishes to only a small fraction of the complete and current database it uses for administering written exams. Furthermore, the questions published by FAA are frequently only sample ones that do not necessarily appear in official examinations in the same format. Aviationexam has been in the business of providing effective test prep solutions for pilots for over 10 years. Our team of experts includes not only professional airline pilots and flight instructors, but also question bank specialists with an extensive experience and many tools of the trade to ensure Aviationexam products stay on top of the latest FAA updates. Our customers can rest assured that our staff works hard on a constant basis to maintain our products updated with the latest actual FAA questions. Even though our database does not provide an absolute guarantee of 100% FAA question bank coverage (when some websites tell you they do, think about it a little bit) we can definitely say that our products get as close to the 100% coverage as it is currently possible. There might be a question or two on your official written test that you did not have a chance to preview beforehand using our test prep, but in general this number of new questions not included in Aviationexam database yet is very very small. I got a list of some EASA questions from a friend. Why should I buy your product instead? Aviationexam products provide an excellent and precise representation of the various versions of the official ECQB. Individual Civil Aviation Authorities (CAAs) may use different versions of the EASA ECQB and most of the times you never know which one is used by your CAA. For this reason it is good when the test prep system you use covers multiple question bank versions. Typically the free question compilations represent only an incomplete set of questions, based on a single and outdated version of the EASA question bank (at times even a much older version, the former JAA CQB). The older versions of EASA ECQB and JAA CQB were “famous” for the large number of errors contained in the questions / answers. While some errors still persist in the official question banks some have been corrected by the authorities and questions + answers rephrased. Occasionally new questions are added by the authorities as well as some outdated ones removed. With a no-name PDF question compilation you probably do not know the type of source and how old these questions are => you could be studying from a material that contains more errors than the official question bank and most likely will miss-out on the latest new question additions. Aviationexam is the only test prep system that provides the students with an explanation of every single question in the database by Aviationexam. Even the most complicated questions are explained in our products. It is not the case with a no-name question compilation. If you encounter a question where you are not sure what the proper solution method is, you might spend a lot of time looking for the right study material or a resource. Our customers do not have to waste their valuable time and can devote it to studying the specific materials instead. Many questions in our EASA ECQB exam prep database require the students to use a picture supplement such as tables, charts, symbols, etc. With a no-name question compilation the picture supplements are typically not included or their quality and readability is not very good. Aviationexam test prep system always provides you with a high quality picture supplement for every question where it is required. Every single question contained in Aviationexam database has been carefully sorted into the respective subject and area of the EASA exam syllabus. All questions have also been assigned to the correct competency level such as ATPL, CPL or IR. Our customers can use simple, but effective filters to only work with the question that are relevant to their specific exam competency level. In this way students preparing for Instrument Rating exams can focus only on the greatly reduced number of questions relevant to the IR exams and omit the unnecessary questions that apply only to the CPL or ATPL syllabus. With a no-name question compilation you typically do not know which topic each question belong to and which competency level (syllabus) it is relevant for. These are just a few examples of what additional features Aviationexam products can offer you over the use of a no-name question compilation. Many of the features are even unique to Aviationexam over our commercial competitors! I think I found an error in one of the EASA test prep questions or answers. The first thing to do is to check the explanation provided for the question. In the case of some difficult or tricky questions the explanation will show a note explaining the common mistakes the students make. If you do not find the answer there you should check to see if there are any user comments posted for this question. Frequently the tricky questions will have quite a lengthy discussion going on and you are likely to find an answer already being posted. In some cases the answer choices provided by EASA can be ambiguous or "questionable". It is unfortunate and a well-known deficiency of the EASA exam system, but that is the way the questions appear in the official examinations. We typically maintain this ambiguous wording in our database as we believe our customers should get familiar with the question in the format they will eventually encounter on exams. A note on this will typically be posted in the question comments section. If the question has not been discussed before in the comments section, please, let us know using the contact form in one of the apps or through our website (select the topic “Database Content Issue”). Alternatively, you can always send us an email at support@aviationexam.com. In both cases, please, make sure you mention the ID# of the question. Do I always need to be online to use Aviationexam? No, you do not need to be constantly online. If you use one of our apps then you only need to be connected to the Internet for the initial setup (import of your user account data). After this our apps provide full offline functionality – you can take your studies with you even if you have a slow, unreliable or no Internet connection at all. For more detailed info on the offline functionality, please, see the FAQ section of the respective software platform you wish to use. The availability of dedicated apps with offline capabilities for all major operating system platforms is one of the unique features of Aviationexam you will not find with our competitors. If you wish to use Aviationexam on your iPad (or other device) you do not have to use the web browser like our competitors will ask you to. Instead, you can download a dedicated app that will allow you to study even without an Internet connection. To continue with your studies online or on a different device / computer, simply connect to the Internet and synchronize your user account. The primary method of payment in our eShop is the secure online credit card payment. You can use the following cards: VISA, MASTERCARD, ELECTRON, MAESTRO. The online payments in our eShop are the fastest way of completing your order. Immediately as soon as your online payment is done we can start processing your order. You can activate the question bank subscription immediately as soon as you make the online payment. Another option is to activate the subscription at a later date at your convenience with the activation code. The most frequent problems that some of our customers experience (when making an online payment) is the fact that some VISA ELECTRON or MAESTRO cards are blocked by the issuing banks for international or online transactions. We recommend that you try another credit card (preferably a standard embossed VISA or MASTERCARD). Alternatively, you can ask someone to help you with the payment – for example ask your family member or a friend to make the payment for you using their credit card. Our system does not require the name on the card to be the same as the name on the order. The payment can be also processed via PayPal. In this case, please select American Express from the offered types of credit cards at our web page (it doesn’t matter what card do you actually have). The PayPal button will appear. When you click on it, it will transfer you to PayPal pages, where you can login into your PayPal account and process the payment. If you do not wish to make an online payment or if you do not have a credit card, or experience problems when paying with your card (eg. card is blocked for online purchases) you can alternatively make an offline payment - using a bank transfer directly to our bank account. If you decided to use this method, please, notify us via email at sales@aviationexam.com for further details. When making an offline payment we start processing your order as soon as your payment is received. Please note that the transactions within EU takes usually 1 business day. Transactions outside EU take about 3-5 business days and may contain additional bank fees related to the transaction. How secure is your eShop? Is it safe to make payments online? We treat the online security issues with the highest level of attention. We have implemented many security features and functions to meet the highest online security standards available today. All of the data that Aviationexam users exchange between their computers and our servers are encrypted using Thawte SSL digital certificate. Even though we do not come into contact or process any of your financial information on our servers we still want to offer you the highest security level throughout our web site using data encryption - firstly to protect your personal details as well as prevent the theft of your user login information. When using our online payment system you will always be redirected to a secure server of our bank's credit card payment gateway where you can enter your card information. We never see, handle or store your credit card information - we only receive the final result of the transaction (SALE OK or DECLINED) from our bank. This is the safest way to process online payments today, because you are always dealing directly with the bank - with their secure servers that have the latest security technology features implemented. What is the CVN / CVN2 (Card Verification Number)? CVN stands for Card Verification Number (sometimes called CID - card identification number or CVC - card verification code), and it is one of the ways that merchants and card issuers are working together to increase credit card security. 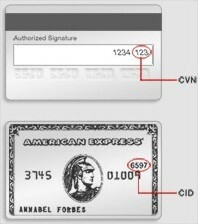 The number is a 3 or 4 digit code that is added to your card on either the back, above the signature strip, or the front, above the embossed number. It never appears on receipts or imprints of your card. Your access can be activated automatically or manually. These options to Activate now or Activate later are offered during the purchase process, when the order and payment are complete. When selecting this option, the subscription is activated immediately as soon as your online payment is received - there is no manual intervention needed from the administrators of Aviationexam or from you. If you are making an online credit card payment you can be studying in a matter of minutes, regardless of the time of the day. To use the system through our apps, which don't need the instant internet connection, please sync the respective app with our server in order to download all the data to the app. Manual Activation gives you an opportunity to activate the subscription later. For example you purchase the subscription in January, but you can activate it at will - for example in May or even a year later. To activate the subscription, please login at our web page - select MY ACCOUNT from the DASHBOARD - select the tab Subscriptions. Then click on "USE" button at the bottom of the page. In case you received the Activation Code from your friend (as a present or because you decided to take the advantage of purchasing more items under one user name for a better price), you will need to activate your subscription manually as well. Please login at our web page and proceed to Dashboard -> My Account -> Subscriptions and there you can enter the Activation Code. Confirm it by clicking the "OK" button. Expired Subsription - will I be able to access my online user account after my subscription expires? Aviationexam question bank subscription is time limited. During the period of the subscription you can run unlimited number of practice tests from all of the subject areas for which you have purchased question bank access. After your subscription expires the question database will become locked for you - you will no longer be able to generate any new tests. You will also not be able to see the details of your grade reports or use some of the advanced system functions that display the questions. However, all of the data will be kept on our server - if you decide to extend your subscription at any time in the future you will be able to start your training right where you left off - all of your testing history and reports will remain saved on our server. Please make sure you are logged in our online system and go to: Dashboard - My Account - Orders: click on the Download link in column Invoice. The eShop calculates the discount automatically. So simply login with your user name and password at our web page, go to eShop, choose the subscription according to your needs and type the number of items you wish to purchase in the box in front of the BUY button. When the order is completed, you will receive respective amount of activation codes for subscription activation. The codes will be visible at your subscription detail page (Dashboard - My Account - Subscriptions) as soon as you complete the payment. To activate the subscription, go to subscription detail page and activate 1 code for yourself while using USE button. Then send 1 code to each of your colleagues. They need to login with their own user names at our web page first and then they can activate the access with the code at subscription detail page or at the start test page. Who does not have user name yet, they can get it through free registration at our web page. The registration is free of charge and it takes 2 minutes. The access starts at the day of activation (it does not start on the purchase date), so each user can activate the access whenever it suits them. How can I purchase something from Aviationexam? Purchases are available for registered users through our eShop. Registration is free of charge and the form is available here. Once you are registered, please click on eShop link at the top of the page. Click on the desired product category. The list of products for selected category will appear. Select a product to display more details. Use BUY button to purchase the product. If you wish to continue shopping, click on the < in the top left corner of the screen to get back to the eShop and select another product. When you are finished, click on the button PROCEED TO CHECKOUT. Select the order type: personal or business, review your billing details and read the terms & conditions - tick the option "I agree" and specify the type of your credit card -> the button GP Web Pay or PayPal will appear. Click on it and you will be transferred to a secure bank server, where you can safely enter your credit card details. Please note that we do not come into contact with your credit card information - you are supplying this information directly to the bank that only notifies us if the transaction has been processed OK or if it has failed for any reason. When can I start using the subscription I just purchased online? When selecting this option, the subscription is activated immediately. There is no manual intervention needed from the administrators of Aviationexam or from you. To use the system through our apps, which do not need the instant internet connection (iOS, OS X, Android, Win apps), please sync the respective app with our server in order to download all data to the app. Manual Activation gives you an opportunity to activate the subscription later. For example you purchase the subscription in January, but you can activate it at will - for example in May or even a year later. To activate the subscription, please login at our web page with your user name and password, at the DASHBOARD - select MY ACCOUNT and click on link Subscriptions. Then click on "USE" button at the bottom of the page. In case you received the Activation Code from your friend (as a present or because you decided to take the advantage of purchasing more items under one user name for a better price), you have to process the manual activation as well. Please login at our web page and enter the Activation Code into the yellow line at the subscription detail page (DASHBOARD - MY ACCOUNT - Subscriptions). Confirm it by clicking on "OK" button. How can I extend the validity of my current subscription? Simply purchase a new subscription. It will be added on the top of your current subscription (you will not lose anything). And if you wish to purchase a subscription now and activate it later, you can do that too. Once the payment for your order is processed, select the option "Generate Activation code". You will be able to find the Activation Code & PIN at the bottom of your subscription page (DASHBOARD - MY ACCOUNT - Subscriptions). Click on the USE button which is displayed right next to the Activation code and PIN in order to activate the subscription. Anyhow, once your subscription expires, you will not lose your testing history, flags or settings. You will not be able to display content of the database, but we do not delete user's accounts or testing history. All data stays at our server and when you decide to purchase new subscription in the future, you will be able to start exactly where you left off. I want to study using iPad / Windows computer / Android device / etc... Which subscription shall I purchase? Select the subscription which best suits your needs in terms of content and length. It does not matter where you buy it (eShop or In-App purchase), it will work on all offered platforms. User with valid subscription can use the online system at www.aviationexam.com and up to 3 different applications, which don’t need the instant internet connection: iOS, OS X, Android, Win apps at one time. The user account can be synchronized across all devices through our server. Example: When you finish studying at your iPad, sync the iPad application in order to upload all your testing history to our server (online system). Later, when you wish to start at your Android phone, sync the app at your Android phone to download the testing history from our server (online system) to the Android app etc. It is good to have the testing history synchronised, because the system analyses your testing history when generating new tests. I need to prepare for EASA CPL / IR / EIR / PPL exams – which subscription should I purchase? All EASA subscriptions cover ATPL, CPL, IR and CBIR/EIR levels for airplanes and helicopters. You can select specific level when you create a new test. For example: ATPL (A), IR (H) etc. So when you study for example for IR, you do not need to go through ATPL questions. All questions are sorted into individual subjects and areas/subareas for respective competency levels in accordance with current EASA outline. Unfortunately, we do not offer EASA PPL questions. Can I temporarily pause (freeze) my subscription validity when I’m taking a time off from studying? No, unfortunately this is not possible. If you expect you might take a longer time period off from your studies we suggest that you purchase a license with a shorter period of validity. When you are ready to resume your studies you can purchase a new license. What are the differences between STUDY and EXAM testing modes? This mode is intended for study purposes. What does that mean in practice? Apart from the subject and level, you can also choose specific subject areas for your test. You can go through explanations, which are available for each Aviationexam question (EASA or FAA test prep), write personal notes or engage in the comments discussion. There is no time or question limit for a study test. You can also save it and come back to it later. During the study test, the correct answer is displayed immediately after you select your answer choice (this can be changed in settings). You can mark questions with pin, so you can easily find them before finishing test. Another possibility is to mark the questions as "for review” or with flags (show 1x in next test, keep testing, do not test). When generating a new test in STUDY mode, all the tests you have already finished are analysed. For this reason it is recommended to create tests with lesser number of questions and finish those tests, rather than save a test with hundreds of questions. The system is designed to primarily supply you with questions that you have not seen and the questions that you answered incorrectly (by default). It is to ensure that you go through all available questions and help you go through the mistakes. In case you have flagged some questions, the system will generate a test with respect to those flags ("keep testing” + "show 1x in next test”). Questions flagged with “do not test” and marked as “for review” (see below) will not be used. The system will generate the test with questions, which you have not seen before. If the test cannot be generated, you have seen all questions. When new questions are added to the database, they will be unseen. Note - if you do not see any unseen questions and your progress is not 100%, please click here. The system will generate the test with questions, which were answered incorrectly in the past. An incorrect question is a question that has never been answered correctly by you. In case you have answered the question correctly at least once, it will no longer be marked as incorrectly answered. The system will generate a test with questions marked as “for review”. If the test cannot be generated, you have no questions marked as For Review. Please note For Review is a separate parameter to the flags mentioned above. To fully benefit from the settings and flags, make sure you sync the applications often. Having testing history and flags synchronised is essential for starting a new test. Also, as mentioned above, keep in mind that only finished tests (ones that are NOT saved) are reflected in the statistics. This mode simulates the official written exam along with the same settings and features that await you when you sit the real exam. You are not allowed to change the pre-set number of questions nor the time limit (both of these values are pre-set to comply with the parameters of the official written exam for each given subject). Exam grading and display of correct answers takes place at the end of exam test. Test in exam mode can not be saved. The strategy for exam tests is to cover all areas. It means that a test always contains some questions from each area (with ratio to respect count of questions in particular area). Also, please note that the EXAM mode disregards your flag settings - if you wish to have a test according to your flag preferences, please create a test in the STUDY mode. Did you know that you can also create a test with questions that are difficult for you? To do so, please see the section Questions -> Difficult -> Choose a subject and the option to start a test with difficult questions will appear. Only 5% of questions from each subject is available for users without registration and valid subscription. Registration is required in order to purchase the subscription. User without valid subscription can make unlimited number of tests, but they will see only 5% of questions from our database. In case you would like to start from the beginning, you can reset your progress of a certain subject (or several - that is up to you). This way the system would behave as if you have never seen any of the questions from a chosen subject before. Then the system would again mark questions as incorrectly answered until you answer them correctly at least once. A reset will not influence your flags - they will remain. Dashboard - Reports - Progress: display the progress according to your criteria and click on the “…” icon displayed next to progress icon for respective subject at right hand side. The reset button will appear - click the reset button. Dashboard - Reports - Progress: display the progress according to your criteria and swipe the respective bar from the right edge to the left and tap on the reset button. Make sure you synchronise all your devices after you reset the progress so that the change can apply on all your devices as well. You can still display your original progress from the last reset or from the beginning of times (from the time you started studying with Aviationexam) - Dashboard - Reports Progress - Show progress from last reset option. I want to make sure that I cover all the questions contained in your database - how do I do it? Online Test Prep System and applications (iOS, OS X, Android, Win) include advanced functions that allow users to gradually cover the entire set of available questions for a specific subject and a specific testing competency level. You can use the STUDY mode for your practice tests. Use EXAM mode in order to simulate the official exam. NOTE: For more detailed description of the test modes see the topic “What are the differences between STUDY and EXAM mode”. If you wish to cover the entire database of questions for each subject area in STUDY mode, do not delete your completed tests (do not reset your progress). If you delete your completed tests, our server will have nothing to analyze and you’ll start from the beginning. Due to the large number of combinations among operating systems and browser families and versions, we are not able to test our site on every platform and internet browser. However, we are confident that you should be able to view our website without any problems using a reasonably modern browser and operating system. Please go to our web page www.aviationexam.com and select the item "Forgotten Password" (in the login section). Enter your username OR your email address and click on the "CONTINUE" button. Check your mailbox and follow the instructions in the email. If you do not receive the email within about 10 minutes, please take a look at the SPAM folder of your email account - sometimes the email systems flag the email message as SPAM and automatically move it into the SPAM folder. Please note that if your account uses Facebook or Google Account login method, resetting your Aviationexam password will not help. To login, click on the respective buttons (Facebook or Google) at our login screen. Do you still face the problem? Contact us. The online system keeps logging me out - why? First is the security of your user account - preventing someone else from using your account should you forget to log out. Second reason is the test AUTO-SAVE feature = if you experience problems with your internet connection or if your computer restarts itself or crashes your test in progress will be automatically saved by the system. You will be able to restart the test next time you log-in and continue from the exact point where you left off. Without the automatic logout function the test auto-save would not be possible. The automatic logout function is disabled during a test in progress - even if you spend more than 25 minutes solving one question, the system will not log you out. However, users are able to individually deactivate this automatic logout function. To do so, please see your settings and enable the option Keep connection live. If you log-in to Aviationexam and instead of the usual user menu you see a test in progress it is because of the reason mentioned in the paragraph below. You can either continue the test and finish it normally (grade it) or click the "CANCEL" button to cancel this test and to return to the main user menu. When internet connection is lost or if the internet browser window is closed in a non-standard way (eg. computer restarts or you simply close the window using the "X" icon) while you have a test in progress the test is SAVED automatically for you. If the saved test is in STUDY mode the time will be paused and you will need to start the test manually next time you log-in to continue with it (section "MY SAVED TESTS" on the title page after you log-in). But if the test in progress that was terminated as described above was in EXAM mode then next time you log-in to Aviationexam it will be restarted automatically for you. The time limit does not stop for tests in EXAM mode, so the time keeps running even while you are for example restarting your computer. If you log-in back to Aviationexam.com after the time limit has expired then you will be directed to the Grade Report for this test. The registration is valid for 1 user only. Sharing of user name and password is not allowed and it can result in canceling your subscription. How to synchronize saved tests. Saved tests can be saved on one place only. It is only possible to move them through sync. You have saved test at your iPad and you wish to move it to the web page: sync the iPad app and tick the option "move my saved test from this device to cloud". The saved test will be moved from the iPad to the online system and you will be able to continue with this test at the web page. When you have the test saved at the web page, you can move it back to your iPad or to any other Aviation Exam app . Simply sync the app on your device where do you wish to move the test (iOS, OS X, Android, Win) and tick the option "move my saved tests from cloud to this device". The test will be moved from the web page to the device. This way you can move the saved test from one device to another. To sync the Aviation Exam app on your Android device, please swipe down with your finger at the home screen (dashboard). To sync the iOS app, please tap the arrows icon at the home screen (dashboard). To sync the OS X device, please click on the two arrows in the top right corner at the home screen. To sync the Windows app on a tablet, please swipe down on the screen to bring out the menu and then tap on synchronise. To sync the Windows app on your computer, please right-click with your mouse. This account uses third-party authentication provider - what do I do? Your account uses either Facebook or G+ login method. Please note that it is not possible to use several login methods. Once you select a new login method (Facebook or G+) it is irreversible. The moment you choose a new login method, it is no longer possible to login with your Aviationexam username and password - please login with your Facebook or G+ account. What you see in the progress section is questions covered = questions that you answered correctly at least once (seeing them does not influence it, they need to be answered correctly). Therefore in order to have 100% progress, please use the option in Study Mode test that says "incorrectly answered". Once you go through those questions and answer them correctly at least once, they will be considered as covered and you will achieve 100% progress. Can I use the Win app and access the questions over the web at the same time? Yes, if you have purchased any question bank subscription, you can use the Online Test Prep system at www.aviationexam.com and up to 3 offline applications at the same time. What is the minimum PC configuration? I want to cover all the questions contained in your database - how do I do it? If you wish to cover the entire database of questions for each subject area in STUDY mode, do not delete your completed tests (do not reset your progress). If you delete your completed tests, our server will have nothing to analyze and you will start from the beginning. Please go to our web page and select the item "Forgotten Password" (in the login section). Enter your username OR your email address and click on the "CONTINUE" button. Check your mailbox and follow the instructions in the email. The limit for offline applications is set to 3. If you wish to use our system on another device, please logout from the application on previously used devices. You will be able to login through the application at new device then. I have valid subscription, but the app says: only 5% of questions available. Please sync the app with our server in order to download the databases and subscription. Go to the page „Subscription” and check, if the app indicates valid subscription. When starting the test, please make sure you select correct database (EASA in English, EASA auf Deutsch, FAA) and the correct subject. Application asks me to synchronize in order to revalidate the subscription. What shall I do? The app requires synchronization with our server at least once a month, in order to verify the subscription. Simply synchronize the software. You do not need to download updated questions and pictures. The verification process is short and does not require a transfer of too much data. It can be run from any internet cafe, public networks, phone etc. In case you forget to synchronize the software once a month in order to verify the subscription, the subscription will turn inactive. However, with the next sync, it will become active again (if you have a valid subscription purchased through our eShop or App Store or Google Play or Windows Store). Why should I choose your app among the other? Frequent, regular updates and maintenance of our database. Explanations for all EASA and FAA test prep questions. High quality of picture supplements. Possibility of using online system together with the apps, which do not need the instant connection to internet (iOS, OS X, Android and Win app). I made some tests on iPhone and some on iPad. Can I synchronize my testing history between the different devices? The synchronization is available across all our products. It is provided through our server, so when you use different devices to access our question database, please make sure you run the synchronization between the device and server at the end of each session and again at the beginning of each session. Will the database of questions update when/if a newer database of questions is released? Yes, all content updates are free for users with valid subscription. Anyhow, it is essential to run the synchronization with our server to download the updates. Can I have your iOS application on both devices, or do I have to purchase it twice? You can use our iOS app on iPhone, iPad and iPod Touch, but it is essential to use it under one account. Required version of iOS is 8.0 or later. Do I need internet while using your Apple app? Reading the books and running tests is available offline. Anyhow, some specific features (log in/ log out, sending support messages, view user’s comments and search for questions according to text) and of course downloading the updates and sync require internet connection. It is required to sync the app at least once a month. Does your Apple app cover the same content as your online system? Yes, the content (questions, explanations, picture supplements) are the same for all our products (online system, iOS app, OS X app, Android app and Win app). How to synchronize the app? The figures were not downloaded properly for some reason. Dashboard - Settings - Data usage: delete the database of the subject. Then sync the app and download the database again. Do you provide offline solution for MAC users? Yes, we offer free OS X app. You can download it from the App Store. OS X 10.9 or later is required. Anyhow, the internet connection is needed for downlading the app its updates and for synchronization with our server (if you use our system on different devices). Where can I get the the OS X app? Is it possible to make some tests through your online system and some through OS X app and synchronize the testing history? Yes, it is possible. The synchronization is available across all our products. It is provided through our server so when you use different devices to access our Question Database, please make sure you run the synchronization between the device and server at the end of each session and again at the beginning of each session. If you wish to cover the entire database of questions for each subject area in STUDY mode, do not delete your completed tests (do not reset your progress). If you delete your completed tests, our server will have nothing to analyse and you will start from the beginning. What are the differences between STUDY, EXAM testing modes? Do you provide app for smart phones and tablets with Android? Yes, the app for smart phones and tablets with Android can be downloaded from Google Play. Yes, all content updates are free for users with a valid subscription. Anyhow, it is essential to run the synchronization with our server to download the updates. Can I use your Android app on my tablet and also on my phone? Yes, you can use our online system together with up to 3 offline apps at one time. Do I need internet while using your Android app? Reading books and running tests is available offline. Anyhow, some specific features (log in/log out, sending support messages, view user’s comments and search for questions according to text) and of course downloading the updates and sync require internet connection. It is required to sync the app at least once a month. Does your Android app cover the same content as your online system? Yes, the content (questions, explanations, picture supplements) are the same for all our products (online system, iOS, OS X, Android and Win app). Dashboard - Reports - Progress: display the progress according to your criteria and tap on the context menu icon at the right edge of the progress bar and tap on "Reset". The limit for offline applications is set to 3. If you wish to use our system on another device, please logout from the application on previously used devices. You will be able to login through the application on new device then. Do you still face the problem? Contact us. Please sync the app with our server in order to download the databases and subscription. Go to the page „Subscription” and check, if the app indicates valid subscription. When starting the test, please make sure you select correct database (EASA in English, EASA auf Deutsch, FAA) and the correct subject. Do you still face the problem? Contact us. Saved tests can be saved at one place only. It is only possible to move them through sync. To sync the Android app, please swipe down with your finger at the app home screen (Dashboard). How can I display eBook sample? eBook samples are accessible in our Aviationexam app: Login with your user name and password * and run synchronization. Then select: Dashboard - Store - EASA or FAA - tap on Book icon in the top section of the screen, the list of eBooks will display. Tap on respective eBook and then open link "SAMPLE". Is it possible to print the eBook? eBooks are accessible through Aviation Exam applications only. You may find the eBooks in our applications by going to Library. In case you have recently purchased an eBook and it does not appear in your Library as available for download, please synchronise your device. The book will be in your Library then. To sync the iOS app version 8.0 and higher, please tap the arrows icon at the home screen (dashboard). I bought eBook through your web page and it is not appearing in the app library. Please login at our web page with your user name and your password - go to subscription details page (Dashboard - My Account - Subscriptions) and click on the USE button at the bottom of the page. Then sync the Aviation Exam application. The books will appear in app Library then and will be available for download. - EASA eBooks are available for apps only. - FAA eBooks are available for apps only. You can check out some of our short videos for better illustration. If you do not find the answer to your question in our FAQ, please contact us.